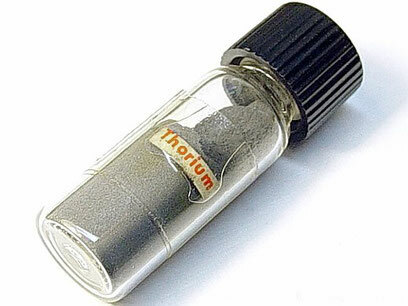 Thorium belongs to Actinides family, has chemical symbol Th and atomic number 90. Thorium by far is the most stable and frequent actinoid, the half-life of 232Th is 14 billion years. The soft, in pure form silvery metal is chemically reactive and light toxic. However, its weak radioactivity can become dangerous, if it is inhaled. Therefore it is not longer much used for mantles in gas lights, which it was for a long time. It is used for some special alloys and in good camera lenses (as ThO2). Thorium decays to radium. Incredibly rare and high purity Thorium metal, sample of the element 90 of the periodic table!